Any colour variations will be assessed at the Judge's discretion. Colour is defined according to the colour found at the skin level at the midside point on the blanket of the alpaca. It is defined as the colour closest to the AANZ Colour Chart. 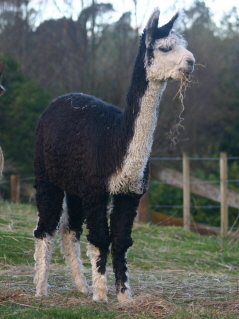 Should an alpaca be between colours, it is classified in the darker of the two colours. The exception being that alpacas are classified as light fawn if they have any evidence of fawn on the head, neck or backline. The colour on the IAR Certificate may be different to the class an alpaca is shown in. An alpaca is defined as "solid" for show class purposes by assessing the blanket area. Secondary colour on legs, head, neck or tuxedo is irrelevant to colour classifications. Alternatively you can elect to show tuxedo alpaca in the fancy section (see below). Grey: A grey fleece is defined as a silver grey (a fleece with grey, black and white fibres where the white fibres are predominant) and a rose grey (a fleece with grey, fawn, brown and white fibres where the white fibres are predominant) A predominantly grey alpaca is to be shown in either a grey class (where a separate grey class is offered) or a combined grey/roan class whether or not it has any coloured spots present and any colour variations will be assessed at the Judge’s discretion. Roan: A roan is an alpaca that is brown, black, medium or dark fawn with a significant amount of easily visible white fibres consistently distributed throughout the entire fleece once the fleece is opened. From the exterior roans may not appear to have white fibres at all, often appearing as the base colour when viewed from a distance. Dark fleeces that display white fibres due to age are to remain in their base colour class, as are dark alpacas with white fibres which are visible, but not yet significant, or consistently distributed throughout the entire fleece. Any such colour inconsistencies will be assessed at the Judge’s discretion. distance. 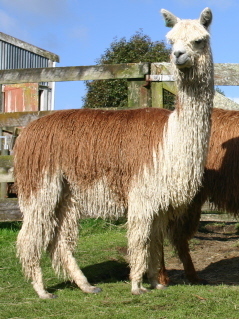 A roan alpaca may or may not have other white markings. Dark fleeces that display white fibres due to age are to remain in their base colour class, as are dark alpacas with white fibres which are visible, but not yet significant, or consistently distributed throughout the entire fleece. Any such colour inconsistencies will be assessed at the Judge’s discretion. 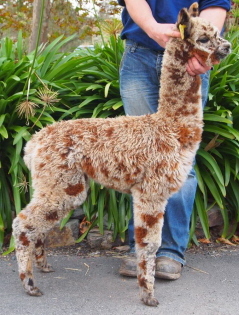 Fawn alpacas are allowed to have variation in fawn across the blanket, and should be shown in the fawn class closest resembling the colour on the midside. 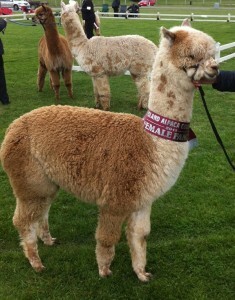 Spot Rule: An alpaca shall qualify as a "solid" colour for show purposes if it displays spots or patches that do not define it as a fancy alpaca (i.e. it can display up to five spots of colour distinct from its primary colour, or can exhibit a patch which is less than 120 mm in any direction. Fancy alpacas are defined as any alpaca which is not grey and has more than 20% of nondominant colour/s. Pinto – The blanket area has two colours. The base colour is usually white with large patches or blobs of the second colour (black or brown). Tuxedo – The blanket area is one usually solid colour with a stripe of white down the neck, and often white socks and face. Appaloosa – Must have 6 or more evenly sized spots thru the blanket area. They can have other spots as well. The nose is plain. A Leopard Appaloosa has spots on its nose to the tip of its ears and all over the body down to the toes.